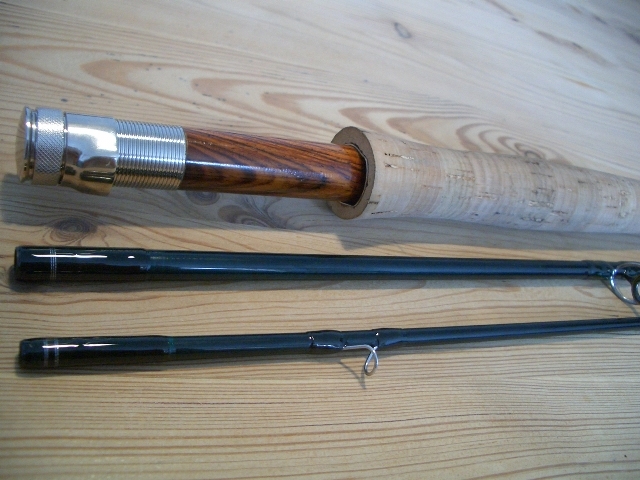 You might already have seen the short blog entry for my first fly rod building project. So, on Friday I suddenly felt like I’d have to act at once and place an order for some rod building material. There are several reasons. One reason is that I am all alone at home from the 18th to the 26th of this month. Sarah, Erik and Einar are going to Nuremberg. Being busy kills time. Another reason is pure consuming desire I just wanted to do something besides the usual things. Yes, recently I once again enjoy sitting on the table in the evening doing handicraft work. In short it means less computer related occupation at home – I spend enough time at work in front of my screen. I’ll blog in detail the steps of building the new rod when all the parts have arrived. This afternoon I have successfully finished building my first fly rod. I have bought two identical Loop blanks from the Loop Green Line series in 9’3″ and the specified line class is #6-7. I am very satisfied with the result and waiting to test it extensively. If the rod performs well I am going to build yet another.